Becoming a successful e-learning professional takes more than just strong design and development skills. If you want to be seen as a credible pro by your peers, your clients, prospective employers, and the learning and development industry at large, you need to broaden your definition of professional development. I’m not just talking about building your instructional design or e-learning development skills; I’m talking about building your personal brand. In the coming weeks, I’ll share tips and tools to help you identify your brand attributes and proactively manage your brand in a way that consistently communicates your personality and values, and bolsters your credibility. 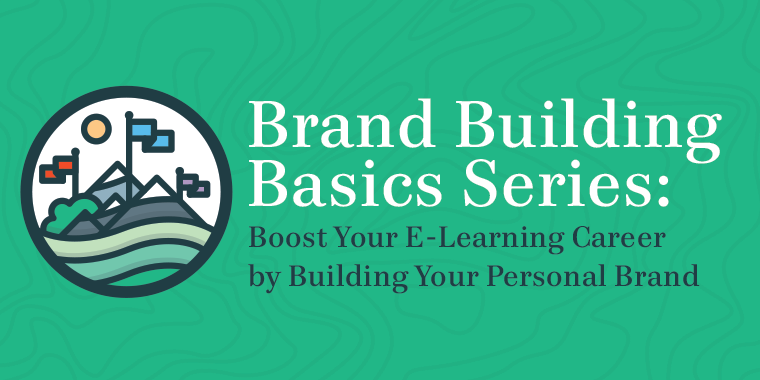 For the rest of this article, I’d like to shine the spotlight on personal branding—what it is and why it matters—and give you some key questions to consider to start tailoring your brand for e-learning career success. Your brand is how you present yourself in your professional community. It’s a combination of your reputation and your value proposition. It’s what people think you can offer, combined with how well you’ve made yourself known. Why does a personal brand matter? If you’re actively building your career—either through freelance work or from within an organization—you’re already building a brand, whether intentionally or not. At one time or another, you’ve left an impression on someone by virtue of your participation in modern life. And, with the internet, people have more access than ever to the things you say and do. From your interactions in the workplace or classroom to your professional affiliations and your virtual interactions on social media sites (Facebook, LinkedIn, Twitter, etc.) that make up your digital footprint, your words, ideas, and actions have already contributed to your personal brand. While your digital footprint makes it easier for people to learn about you, the larger culture shift to a more fluid employment economy means that people are looking at your brand more often. According to the Bureau of Labor Statistics, in 2014, Americans’ typical job tenure was about 4.6 years. This is a far cry from the 10-, 20-, or 30-year job tenures many of our parents had. This means you need to be more shrewd in growing, nurturing, and protecting your personal brand. And with many more people competing for work, especially the creative work we do in e-learning, you need to continuously rebuild your brand rapport to broaden your network and attract new opportunities. What does it mean to build your brand? In short, brand building means identifying your brand’s mission, vision, and personality, and connecting all of your professional activities and public communication to those concepts. It also means you’re investing in your own professional development to make sure your brand stays relevant and competitive. What does your online presence look like? We all have a digital footprint. Take some time to Google yourself and see how, when, and where your footprints lead. Do you come across as a confident, credible, and informed e-learning professional? It’s a good idea, if you haven’t done so already, to separate your personal and professional social media presence. Do you have a website or online portfolio? If so, how easy was it to find when you searched? If not, you may want to work on creating a portfolio with these tips from Tom Kuhlmann. How are you adding value? Many people accuse social media sites of being a waste of time. I’ve found that perception is often the result of the messages being shared, rather than the medium itself. Becoming a trusted curator is a great way to build your network and your personal brand. Before you share content, always read it and consider how well the focus and tone mesh with your brand. Add value to your network by placing the links or content you share into your professional context. Take care to reference the source of the content or otherwise give credit where credit is due. Who are your favorite brands? E-Learning Heroes has some serious rock stars in its ranks. Who do you admire? What do you admire about their user profile and their contributions to the community? You can also find brand inspiration by brainstorming companies and celebrities with strong brands. What attributes of their brands resonate with you, and why? Later you can use your insights to help identify some themes for your own brand’s identity. What are you doing to proactively manage your professional development? Share your ideas, tips, and questions with us by leaving a comment below. And while you’re at it, we’d love for you to follow us on Twitter, where we post the latest and greatest news about everything e-learning. Hi Richard. Thanks for reading & commenting! In my case, branding my name worked out well for me because my ambition was simply to be independent—not necessarily to be an entrepreneur. If I'd had entrepreneurial tendencies, I think I would've pursued branding my company more aggressively to give myself the leeway to grow. If I'm honest with myself, I'd have to say that as an independent contractor, my biggest ambition was to control my own career destiny—not to grow a successful business. On the practical side, I know there are legal and tax implications that go along with each decision. I thought this discussion thread (https://community.articulate.com/discussions/building-better-courses/freelancers-how-d-you-pick-your-company-name) nicely captured some of the benefits & drawbacks of each approach, so if you haven't already read through it, definitely give that a look! Thanks for the link Trina, it was a good resource. Hi Trina, Thanks for sharing these great tips on branding. Thanks, Parashuram. Glad you found these tips helpful. This is great Trina, I am just going through a rebranding exercise here! Thanks for the kind words, Phil. Glad this one resonated with you and felt so relevant. Cheers! This is something I need to do. Thank you for taking the time to share these tips! You're quite welcome, Todd. Glad you found some helpful pointers in here!